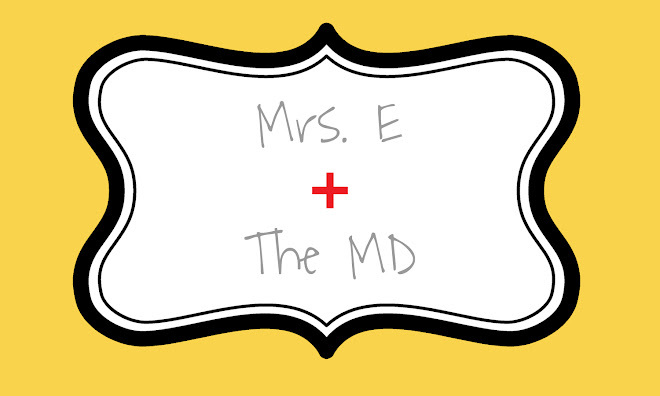 Mrs. E and the MD: Congrats, Chris & Megan! I can hardly believe that September is almost over! It feels like only a couple days ago that we went to the Notre Dame game over Labor Day weekend. Now it is almost October, and I couldn't be happier. This September has not been all that Fall-like, although this past weekend was a sign of weather to come. It was sunny, breezy, even a little chilly by nighttime, and that is just the best! We had a fabulous weekend in Muncie. Our friends, Chris & Megan, got married, and Luke was an usher in the wedding. We had the rehearsal and rehearsal dinner on Friday night, the wedding on Saturday, and then a post-wedding get-together today. We are so exhausted. In fact, Luke is snoozing on the couch (for the third time today!) as I type this. The wedding was beautiful. It was all black and white, and the bridesmaids' dresses and flowers were a magenta color. The weather was outstanding, and the reception was a lot of fun. I actually was asked to come in and take some "getting ready" pictures of Megan and the girls, so that was really fun. She was a stunning bride. In fact, Luke said that "other than me," she was the most beautiful bride he has seen. Last night, I felt pretty pregnant. The dress I was wearing highlighted the belly bulge going on, and while everyone was enjoying several alcoholic beverages, I stuck to my water and Diet Coke. I was really good about not drinking caffeine during the first trimester, but I have added it a little to my diet in the past couple of weeks. I am allowed 200 mg a day, and one can of Diet Coke only has about 45 mg. I typically have Diet Coke once or twice a week. Sometimes I just need it! Anyway -- the wedding was great fun, but WOW my feet hurt by the end of the night. The reception didn't close up until midnight, so it was a pretty long day for us. However, I loved being around my friends and seeing Chris and his groomsmen and ushers, who most of whom were elementary, middle, or high school friends. It is so cool that people can stay in touch and be friends after so many years. One crazy thing that happened was Chris actually broke is wedding band during the reception. He had a tungsten band that is "virtually indestructible," which is the kind Luke has, but during the reception a large chunk broke off! It actually happened during a pretty hilarious part of the reception, which was when Megan's cousin taught Chris a very interesting dance. It involved some pounding his hands on the dance floor, and that was when the ring incident occurred. However, that ring should not have broken like that no matter what he was doing. He only got to wear it for 3 hours! Luckily, by this afternoon, he already had a new one as the jewelry store was able to replace the exact ring in the store today. Well, I have chicken chili simmering on the stove and a Colts game about ready to come on-- I am exhausted and "kind of" dreading going to school tomorrow, but I know that the weeks are flying, which means the baby is growing, and I am getting closer and closer to lots of exciting things!